Often-times we will be enjoying gambling and an individual adjacent to us becomes impatient and curt. 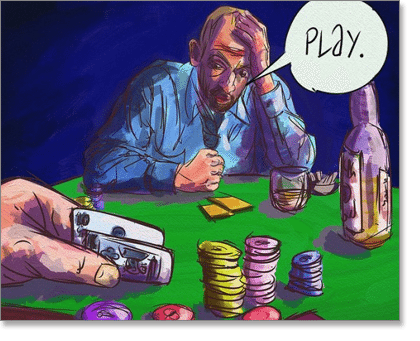 Whether we are involved in a casual game of blackjack at Crown or living it up in Las Vegas, ill-informed players, and often those who have consumed fair amounts of alcohol, can become accustomed to subtly pointing out their frustration with the way others are gambling. If you’re playing within the rules and spirit of the game, there should be no issue with how you decide to bet – otherwise you’d have been told otherwise by a casino manager. The above lines of reasoning, while not only discourteous, are completely misguided. So how do you proceed? It can be intimidating attempting to counter an impolite individual’s opinion, but engaging in conversation in a civil yet stern manner we believe is the best way to go about it. Learned gamblers should be confident in detailing their acquired betting knowledge to ‘not-so learned’ gamblers. The thing to note when gambling is with casino card games played directly against the dealer/house, such as blackjack, Spanish 21, Casino War and poker variants, what an individual player does at the table has a negligible influence on any other player’s hand. Remarkably, the player who has the greatest influence on the outcome of your hand is… you. Studies performed by the Centre for Gambling Research, UNLV (University of Nevada, Las Vegas) as well as other recognised gambling research centres, have repeatedly reported how one person’s play, or where a person sits at a table, has an inconsequential effect in the long run on the outcome of someone else’s wager. Irrelevant of how often you decide to play or the decisions you make while involved in a hand, you being able to regulate if others will win or lose is a nonsensical claim, and it should be rightly corrected. So, respond amicably. Then, gauge the person’s reaction and his/her response; if you can see the individual in question is open to being proven wrong without the situation escalating, continue in the same manner – civilly yet sternly. With a bit of luck, you’ll be able to impart some timely wisdom and teach this person about the true statistics and facts of gambling, and he’ll become a little wiser, and less intolerant. If the individual’s reaction does not warrant a follow-up, or you can see that to pursue your reasoning may very well reach a negative conclusion, discontinue your rationalisation attempt, as now it truly isn’t worth your while. But we think it is best not to passively let an ignorant comment fly by. While we’re no experts in human behaviour, we honestly believe in trying to enlighten those around us, obviously without coming off as egotistical. Because if we do sit idly by, we’ll most likely harness regrets about not standing up for ourselves, and letting an opportunity to teach someone something new slip away. Interestingly, behind the scenes of what can be construed as simple misguided assertions, there is some basic psychology in play. Gamblers are an intriguing community of people: many are superstitious and will often see and remember only what they choose to see and remember – call it selective amnesia. Recalling the time the ‘third-base player’ (the player dealt to last) hit on 16, drew a bust card and the dealer drew to 21, when standing would of forced the dealer to bust, those same people may tend to forget the time that ‘third baseman’ hit on 16, taking the Ace which would have given the dealer blackjack. Someone may take umbrage to the fact the three times you’ve sat out, they’ve lost their hand, but will have completely forgotten about the two other times you didn’t play and they won. “It disrupts the flow of the table,” is a commonly voiced complaint in regards to a player sitting out a hand every once in a while. It’s likely to be disrupting to that person purely if he/she is losing, while if that person was winning, no doubt he/she would feel differently. It was quoted perfectly by Sir Francis Bacon (English philosopher, scientist and author), who stated “the root of all superstition is that men observe when a thing hits but not when it misses,” and there have been multiple studies and experiments which prove just how accurate this theory is.